The Romance Dish: Authors and Readers and Books....Oh, My! One of the highlights of the annual RWA National Conference is the Literacy Autographing. Held the night before the conference opens, this event is open to the public and features more than 400 authors. Books are donated by publishers, purchased at face value by readers and all funds raised donated to literacy organizations. This year, the total raised was $52,309.24. Those funds will go to ProLiteracy Worldwide, Literacy Action, Inc. and Literacy Volunteers of Atlanta. Since 1990, more than $825,000 have been raised in the fight against illiteracy. The Literacy Autographing is wild, crazy, crowded and so much fun. I wouldn't dream of missing it. I mean, really, 400+ authors signing books in one room? What's not to love? Here are some of our highlights from this year's event. Andrea here! Besides catching up with some of my favorite people (Sophie Jordan, Julie James, and Sarah MacLean to name a few), I had THREE highlights from this year's Literacy Autographing. The third highlight for me was getting an autographed book and having my picture taken with one of my very favorite authors, Jill Shalvis. I absolutely adore her books and highly recommend them to anyone who loves contemporary romance! Here are some of my photo memories of this year's Literacy Autographing. NYT Bestselling author, Carly Phillips! I'm loving her Serendipity series. The next book, Perfect Fling comes out July 30th. Jane Porter is not only a wonderful writer but one of the nicest people around. Her next book, The Good Wife will be released September 3rd. So proud of our Dish contributor and good friend, Trish Milburn. Trish was one of this year's recipients of the RWA Service Award. Congratulations, Trish! Simone St. James, who won not one but two RITA awards for her debut book, The Haunting of Maddy Clare. NYT Bestseller, conference keynote speaker and good friend, Cathy Maxwell. When this woman smiles, it lights up the entire room! NYT Bestselling author and newlywed, Laura Lee Guhrke. Yes, she was glowing! It's always fun catching up with romantic suspense author, Kate Brady. She and I met while waiting for the subway train at the 2009 RWA National Conference in Washington, DC. At the time she was still a few months from being published. She's now a RITA winner for that first book. You never know who you'll end up meeting when you strike up a conversation with the person waiting next to you. USA Today Bestselling author Donna Kauffman writes fun books but we skipped the books and went straight to our opinions on who Bachelorette Des is going to choose in the ABC season finale...if she chooses anyone! In addition to her books, Donna also writes a no-holds-barred (as in laugh out loud funny) Bachelorette/Bachelor column for USA Today and at her own site. Check it out at http://donnakauffman.com/blog and the USA Today Happy Ever After blog. NYT Bestseller, recipient of the RWA Nora Roberts Lifetime Achievement award and one of my favorite people, Vicki Lewis Thompson! Nancy Berland (owner of Nancy Berland Public Relations) and NYT Bestselling author, Robyn Carr, smart, savvy and highly successful women who are two of the most gracious and down to earth people you'll ever meet. I ♥ them! After signing books and posing for photos for two hours, NYT Bestselling author, Eloisa James still looks like she just stepped off the fashion runway. One of my favorite authors, one of my favorite people and this year's RITA winner for best novella! One more blog to go! On Saturday, we'll be dishing about the glam shoes and dresses that are on display at the many RWA events and sharing some of our overall conference highlights. And, of course, giving away more books! All winners will be announced on Sunday so be sure to stop by to find out if you're one of our lucky RWA winners. What have been your highlights from our RWA conference blogs? Do you have a favorite among those pictured that you'd like to meet? I would love to meet the Banditas someday. I don't watch The Bachelorette so I don't know who the last two guys are. Jane, 2015 in NYC! See you there! I do hope I'll get to meet you and Andrea. Wow Jane! Let me introduce myself...I'm a Bandita :D Seriously, would love to meet you too and all of our BB's. If I remember correctly, you live in NYC and RWA will be there in a few years! Loving all the pics and reporting from PJ and Andrea from this year's conference. I don't believe there was a book or party left unturned :D Love you all! Looking forward to it, Joanie. You're welcome, Kim! Glad you're enjoying! I have gotten to meet a few of the Banditas, it was a blast, even got to meet the wily rooster. When I walked into the restaurant they asked if I was with the Golden Rooster's party. I said yes, as a matter of fact I am. I would love to meet several of the pictured authors and even more who aren't pictured there. I don't watch the Bachelorette but it sounds like a fun show. I remember when you met up with them, Dianna. Love that the reservation was for the Golden Rooster! lol! I have really enjoyed the pictures of so many authors that I read and love. It's hard to pick one author but I would love to meet Jane Porter. I read her blog regularly and she sounds like a lovely person. Maureen, Jane is just as lovely in person as she is on her blog. I hope you have the opportunity to meet her someday. The smiling faces of all those happy authors has been the highlight for me. How wonderful it would be to meet them in person. Choosing a favorite author would be impossible I love them all. I do have to admit that I get so tickled at the posts that Jill Shalvis and Kristen Higgins put on Facebook. They’re so funny! I am also a Bandita fan and would love to meet them. Anna Campbell and I have promised to meet up for tea if I ever get over to Australia. I used to watch The Bachelorette but haven’t in quite awhile. Connie, RWA National is coming back to Florida in 2017. Hope to meet you in person in Orlando! Jill Shalvis and Kristan Higgins are just as funny in person as they are in their Facebook posts. Anna is a wonderful person. You'd have so much fun with her. It's been three years since we last saw one another in person and I'm in serious Anna Campbell withdrawal! Thanks again for another giveaway. I have not watched the Bachelor or Bachelorette in a while. I just do not care for it any longer. Love Shalvis, Kauffman, T. Blake, Higgins, Malley, Phillips to name a few of my fav - I love contemps - and I think you posted photos of all of them; so thank you. I can only imagine how much fun the authors have and all the fans who get to meet them. I would love to attend one of these things one day with some of my book buddies; I have several cyber book buddies and actually got to meet one last year. What fun. You really don't need to watch The Bachelorette, Pat. Reading Donna's recap is a lot more entertaining than the show! Shoot I was volunteering at the basket tables and missed so many authors at the Literacy signing. I would have loved to have met Carly Phillips! She is a favorite of mine. Can't wait for the next book. I am a big contemporary romance fan. Love Julie James. I did get a chance to stop by her table just to say hi and thank her for sending a book to our retreat. She is a sweetheart. One highlight for me -- a complete surprise, I was headed to the food court and passed two ladies on a seat in the lobby area, I did a double-take, one of the ladies was Linda Howard. I stopped, backed up and said, " I don't want to bother you, but I just have to tell you, I LOVE you!" She graciously smiled at my total fan girl moment. I have loved the pics of the authors. And to find out they are really just like us! Jill Shalvis is one of my favs, not only for her books, but her blogs and facebook posts are so seriously FUNNY! I think I watched a couple episodes of the Bachelorette, but I just couldnt take it seriously. Maybe some day I will make it to a RWA conference. Thanks for the giveaways!! Hope you do make it to a conference, Trish. They're a wonderful experience! As for my favorite I think they are all amazing authors, but Eloisa James is my favorite!! I have a feeling I would em brasses myself if I ever meant her! I'm a huge fan! Savannah, I hope you do get the chance to meet Eloisa one of these days. She has the ability to put you at ease and make you feel like you've been good friends for years. I love Vicki's Nerd books too! More wonderful pics! 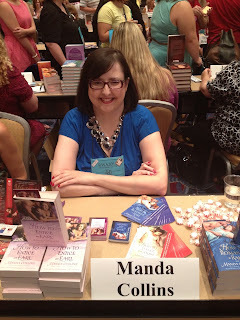 I especially love the ones of Manda and Terri at their first RWA signing. Just thinking about all the EJ/JQ bb alums who are now published authors puts a smile on my face and a tear in my eye. Judging from all your photos and all the excited posts here and elsewhere, RWA 2013 was something special even among RWA conferences. I don't think I've seen this much energy and optimism after any other conference. And I too have no clue about the Bachelorette. I rarely watch TV. I have so many favorite authors that I would find it difficult to know where to start. I'd probably be speechless confronted with 400, knowing most of mt autobuys were among them. There were definitely tears in my eyes, Janga. It was such a thrill to see dear friends living their writing dreams. The author photos are wonderful as are all the authors. I would enjoy meeting so many since they are lovely and very special. Thanks for this great post. Hope you get the chance to meet some of them one of these days! What an impressive and great view of these extraordinary authors whose talent is to be admired greatly. I would love to meet Simone St. James since her books are captivating. Your conference looks like so much fun and I am envious of this get together. What a wonderful and memorable time. Simone St. James was a delight! I had heard of her book but hadn't read it yet. Picked up a copy at the signing and hope to read it soon. No I dont watch it either. Would love to meet Jill Shalvis because she is so funny. Not to mention her wonderful books. I have so enjoyed the pictures. Thanks for taking the time to post them here. I am looking forward to the shoe pictures! I have heard that Kristan Higgins' speech was wonderful, and it made people cry. What made the speech so special? Cheryl, Kristan's speech was one of the best I've heard. There was much laughter during the beginning of the speech. The tears came when she shared painful, private moments with us, such as being bullied as a child and the pain she and her husband suffered when they lost a child. I doubt there was a dry eye in the place. But, after all the tears, she left us feeling hopeful, empowered and with a smile in our hearts. PJ, the speech sounds like her books...poignant, funny, and heartwarming! The highlight of the blogs is getting to know the authors through your pictures and comments. It makes them seem more real and down to earth to me. I put them all up on a pedestal and admire their talent. I would love to meet Sandra Brown, SEP, Karen Hawkins, Jill Shalvis, Elizabeth Lowell, Diana Palmer, Linda Lael Miller and Nora Roberts just to name a few. I don't watch TV so I'm unfamiliar with The Bachelorette. Laurie, the vast majority of them are real, down to earth and delighted to meet their readers! I always wondered why these conventions only occur in the largest US cities. I then read an article that said the choice is based on finding a hotel that can accommodate all these authors and fans. A chain hotel in most medium size cities only has 300 rooms. I've enjoyed all the pictures of RWA. It would be nice to meet Sherry Thomas, Julie James and Judith McNaught. Kim, when you have 2,000+ people attending the conference and need sleeping rooms, workshop rooms and large ballrooms, even some large cities don't have accommodations! I don't know where you live but there are a lot of great regional conferences that are smaller and more accessible. I love all of these pictures. I really have liked your blog about networking the most so far! I am not very good at it, so it was great to read about how much fun it can be at a conference. I absolutely want to me Terri Osburn and Manda Collins in person! Trish Milburn and Cathy Maxwell I would also love to meet. I have "met" some of them online, and can't wait to someday meet them in person. I am a big fan of Cathy Maxwell's books. You are a great photographer. I am enjoying these pictures so much. Thank you for sharing all of them. I am going to the 2015 RWA conference. It will be my first one, and I am already excited... and nervous. I did mention how bad I am at networking, right? Laurie G, I really would love to meet Elizabeth Lowell. Julie Garwood, Julia Quinn... I mean just about everyone. Laura, so glad to hear you'll be at the 2015 conference. Be sure to take advantage of the "First Timers" orientation session that is usually held on Wednesday (before or after the Literacy Signing). Not only does it give you great tips for navigating the conference but it also gives you the opportunity to meet others who are also first-timers and just as nervous as you. Glad you've enjoyed the photos! Btw, I'm hoping to be at NYC in 2015 and am looking forward to finally meeting you! I love how alive these blog posts are. You obviously had a ball, not just attending a conference, but being surrounded by so many people you like and respect. That shows. If I attended a conference, some of the authors I'd love to meet are Julia Quinn, Jill Shalvis, Courtney Milan, Tessa Dare, Julie Anne Long, Sherry Thomas, Lisa Kleypas, Nora Roberts...and the list goes on! That's an awesome list of authors! Hope you have the chance to meet them one of these days. They are all lovely ladies! Looks so awesome. I cant imagine you can make it all the way around the room for the signing, how do you pick and choose! I love the recaps, its great to get to see pictures and hear about these events. Donnas, the list of authors who will be signing is listed at rwa.org prior to the conference. I make a list of my "must see" authors and find them first (all but the "big names" are in alphabetical order at the signing). After I knock them out (figuratively, not literally! ), I then just start going down the rows, saying hello to authors I read and checking out those not familiar to me. It helps to have a method. Otherwise, it's easy to get overwhelmed and miss somebody you really want to see. I love the conferences where the fans can meet the authors we have one here every 2 years called Spring Fling and it is next Feb. and I already want to go... itsw fun to actually meet the authors I read and meet authors I haven't tried yet.. I've heard great things about Spring Fling. I'd like to go one of these days. I can combine it with a visit to my family. I went to the signing 2 years ago in NY and it is thrilling! I have read books by so many more authors now, it would take me forever to get all of the books! 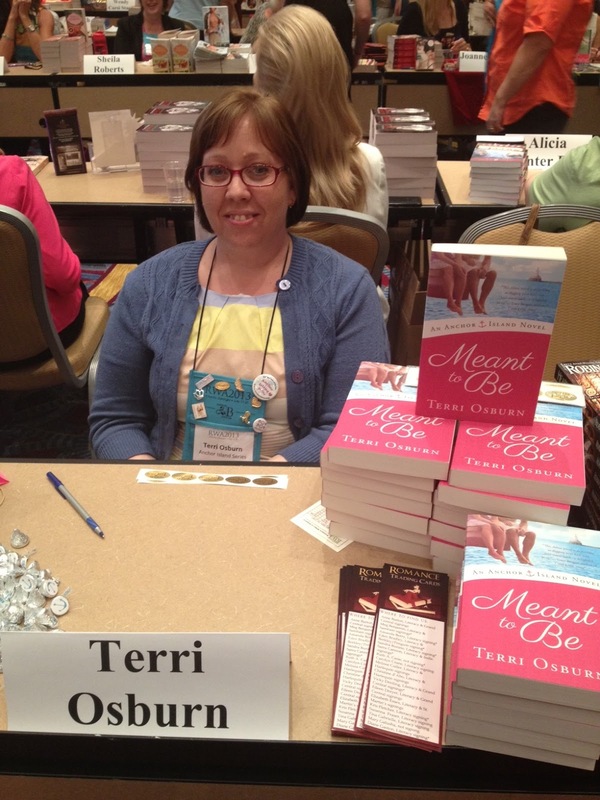 I guess I would like to meet Terry Osburn, since she is new & I love her book! We have "spoken" on FB a few times. I plan on going to the signing again in NY in 2015. Thanks for the pix! Sharlene, I hope you were close to the front of the line for the NYC signing. That was crazy! Terri is a long-time friend and a total sweetheart. I love MEANT TO BE too. Can't wait for our next visit to Anchor Island! Hope to meet you in NYC! LOL! I brought my daughter, who was 11, and we got there 2 hrs early & there was still a wrap- around line. She was not happy with me at all! I got all of the signed books I was trying to get at that point. My library book bag was packed for the train ride home! And yes, I can't wait for Terri's next book, either! Great pics! I would love to meet a lot of these authors. Would love to meet Jane Porter and also Jill Shalvis that is above along with a lot of others. I've enjoyed all the pictures, but I love seeing the pictures from the Literacy signing. I've attended the RWA signing twice and RT book signing once, so I've meet most of the authors I enjoy, but since I love Eloisa James, I'd like to meet her again. Thank you for sharing these awesome posts! I'd be psyched to meet any and all of these authors! I would love to meet Jill Shalvis, Robyn Carr and Susan Mallery. Just read the comment re Kristan's speech. Wow! Sorry she had such sadness in her life but that she gave everyone the feeling of empowerment. Would have had loved to have heard it. It has been nice following the RWA Conference through you blogs and photos. Even if I can't be there, I have been able to know what is happening. It has been great seeing pictures of all the authors who attended. I think it would be interesting to meet and chat with Eloisa James and Heather Snow to name just two of the wonderful authors there. I have enjoyed all of your blogs about the RWA conference! I was lucky enough to attend the autographing event with my daughter and she had to help me stay focused since there were so many authors present and I couldn't decide where to go first! Thanks for all the blogs! I've enjoyed living vicariously through your eyes! 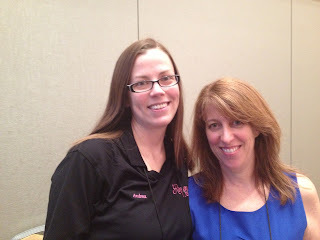 I'm quite jealous of Andrea's pic with Jill Shalvis, she's one of my all-time favorite authors. Not a fan of the Bachelorette/Bachelor series, not enough to hold my interest. Thanks for having all the giveaways! Thanks for the fun recaps! I love seeing all of the pics :) Puts faces to all of the well known names! So many highlights, thank you for sharing your experiences! I'm jealous that I couldn't be there and enjoy it too! I would have loved to meet Jill Shalvis, Eloisa James or Kristan Higgans (just to name a few!). As for the Bachelorette, I haven't watched this season, it's hit or miss for me whether I catch it and lately, it just hasn't interested me. No on The Bachelorette - never watched it; Would love to meet Jill Shalvis and Kristan Higgins and see them together - they seem like they are a hoot. Definitely no on the Bachelorette. Not my type of show. I would definitely love to meet Jane Porter and Eloisa James. They are both fantastic authors. Sorry, I'm not a Bachelorette fan. However this was my third RWA Conference and the best one so far. Too many highlights, but my favorite was seeing Eloisa James win a much delayed but so very well deserved RITA! Not a Bachelorette fan. I'm a huge RWA fan and even though I was there I have enjoyed your coverage of all the events. My favorite was being there when Eloisa won her RITA, at last. She was wearing a delicious golden column dress with beads all over it; she looked like a RITA statue herself! No to The Bachelorette; Sorry I don't watch it. Many, Many highlights, but the best was watching Eloisa James Finally getting her well deserved RITA! maybe I should get my OWN TV???!!! LOL! !